Softvision Explorer 4 software for Internet cafe is able to login in customers by using Smart Cards instead of the traditional username/password. USB interface for the highest speed and maximum easy of use. Also available in a serial version. PS/2 or USB keyboard, Italian layout, with with incorporated ASEDrive IIIe Serial or USB Smart Card Reader. 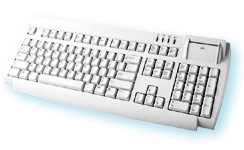 The characteristics of the reader integrated into this keyboard are all identical to those of the USB reader. The main advantage of this solution is the greater elegance and compactness of the navigation workstation. ASEDrive III Driver: driver for USB readers and keyboards with integrated reader.